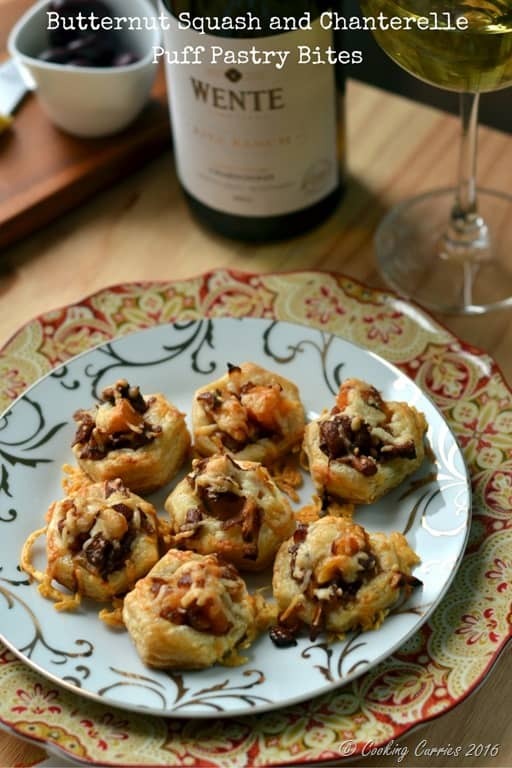 Cheesy butternut squash and chanterelle mushrooms in buttery puff pastry shells is the perfect combination for a smooth fruity Chardonnay. Wow your guests this holiday season with this great food and wine pairing! Great food + great wine + great music + great company = a great holiday party. The formula cannot get any simpler than that. Parties should always be about making the guests feel at ease and have a great time. As a host, there is not really a whole lot you have to do to make that happen. Curate your guest list such that any set of people when left to themselves will have something common to talk about. Load up your party playlist and keep it low enough that people can still heat the ambient music without it interrupting the conversations. As for the food and drinks, I always like to have an appetizer and cocktails/wine party as my holiday entertaining go-to theme. That way I can plan ahead and have a bunch of appetizers pre-made, that just needs to be put in the oven really quickly or heated up in the microwave. I can also set up several tables with a mix and match of various food with the wines paired to it, so guests can just float around and nibble while they enjoy their conversations. 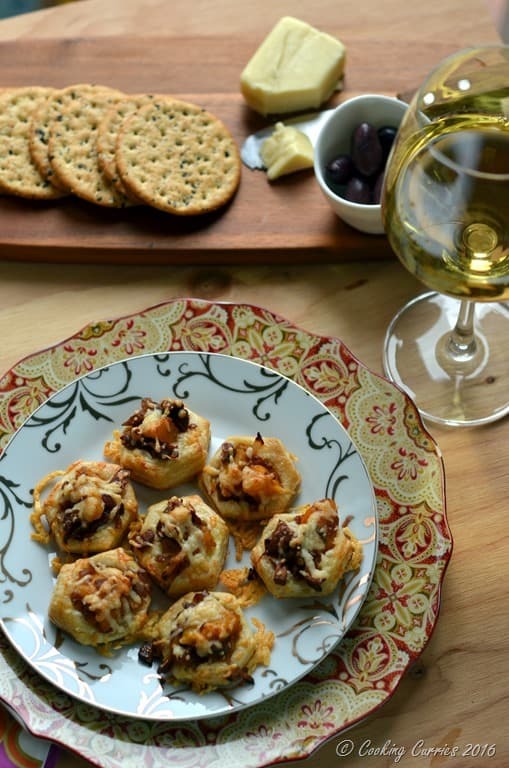 This holiday season, I have teamed up with Wente Vineyards to bring you this fabulous appetizer to pair with their Riva Ranch Chardonnay. This Riva Ranch Chardonnay is a very balanced wine and has beautiful hints of tropical fruits to it. A buttery cheesy or creamy food with either shell fish or any mild fish, winter squash, corn – like risotto or pasta and also creamy vegetable soups are excellent pairings for Chardonnays that usually have very complex fruit flavors to it. That way, when you take a sip of your Chardonnay after any of these foods, it sort of balances out the textures, often acting as a palate cleanser and that works very well for you to enjoy both the wine and the food. Even though I loved this Chardonnay, the one I cant wait to get my hands on is the 2014 Wente Vineyards Morning Fog Chardonnay that recently got a Wine Enthusiast score of 90 points. That said, they do have some other beautiful wines on there too, like the Sandstone Merlot, Southern Hills Cabernet Sauvignon and the Riva Ranch Pinot Noir among many others. Do check out their website to learn more about these wines and see which ones you would like to enjoy this holiday season! Heat the oil in a saute pan and melt the butter in it. Brown the butter a little and add the minced sage to it. Once the sage crisps up, add the garlic and onions to it. Saute for a few minutes and add the chanterelle mushrooms to it. Once the mushrooms soften, add in the spices, salt and pepper and the butternut squash. Sauté till the butter nut squash softens. Add a couple of tablespoons of water, if needed, to help soften the squash. Lay out the puff pastry shells on a baking tray lined with parchment paper or silicone baking mat. Top with a teaspoon of the squash-chanterelle mixture. Top with some asiago cheese and repeat on all the shells. Bake for 20 mins until the puff pastry has puffed up and is crispy golden. Serve with a chilled glass of Riva Ranch Chardonnay and beam at the compliments from your guests.